Win an iPhone X at Leo Vegas Live Casino - 20 to be won! 20 iPhone X’s are up for grabs during November at Leo Vegas. 5 are being given away each week in a prize draw that’s performed each Monday at 17:00 on the Celebrity Blackjack Table. To qualify for the weekly draws to win an iPhone X you have to complete a series of daily missions. 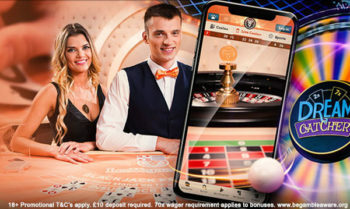 Complete a day’s mission and you’ll get a £20 Live Casino Bonus (with 10x wagering) that’s credited to your account the next day and 5 tickets into the prize draw. That’s £100 in bonuses and 25 tickets a week. Mission 1 – Deposit £50 or more via your mobile. Mission 2 – Spin the Dream Catcher Wheel at least 10 times. Mission 3 – Play £10 on any Live Roulette or Blackjack table. Another way to gain tickets and bonuses is to play Live Blackjack during specific hours on specific tables. For every Blackjack you’re dealt you’ll get a £10 Live Casino Bonus (with 10x Wagering) and 1 Ticket into the prize draw. Leo Vegas Live Blackjack Table 1 – 12:00 – 13:00. Leo Vegas Live Blackjack Table 2 – 13:00 – 14:00. Make sure you’ve opted in to receive Bonuses and Communications in your account. Winners can accept a cash alternative of £800 if they don’t want the phone. The Promotion ends on the 26th November 2017.